Below a blog by Jay Wild, elite international paddle board and outrigger canoe competitor, owner of Watermans Landing and o2fitness athlete. Last September I stopped using a coach for the first time in three years and while I was nervous to embark on a training program on my own I was also excited to put what I have learned to the test. After a winter of paddling my OC1, some strength training with the crew at Crossfit Avalanche and lots of skate skiing I felt that I was ready to put a program together leading into the stand up paddle racing season. At the same time, the Lake Tahoe season was transitioning from Winter to Spring and I was seeing my time for training going into preparing Watermans Landing for a busy summer. I found that every time I sat down to develop a training program leading into a specific race I would instead work on things for Watermans Landing, telling myself that I would get to the training stuff later. As the weeks continued to pass I was still paddling but with no specific program and was really starting to question where this racing season was going to go. That was a scary feeling, being that the previous four years was totally outlined ahead of time with specific races and training goals. At one point I was thinking that I was done racing, there was too much stress and I was putting so much pressure on myself that paddling wasn’t fun anymore. After focusing on work for a couple of weeks I was starting to miss training and when I sat down to figure out my next race and a program for training I realized that I needed help. Thats when I contacted my friend Julie Young with O2Fitness and explained my dilemma. Julie has only paddled a couple of times but her knowledge of training is amazing and I felt as though we could work together on a training program, rather than her just writing it up and me following. 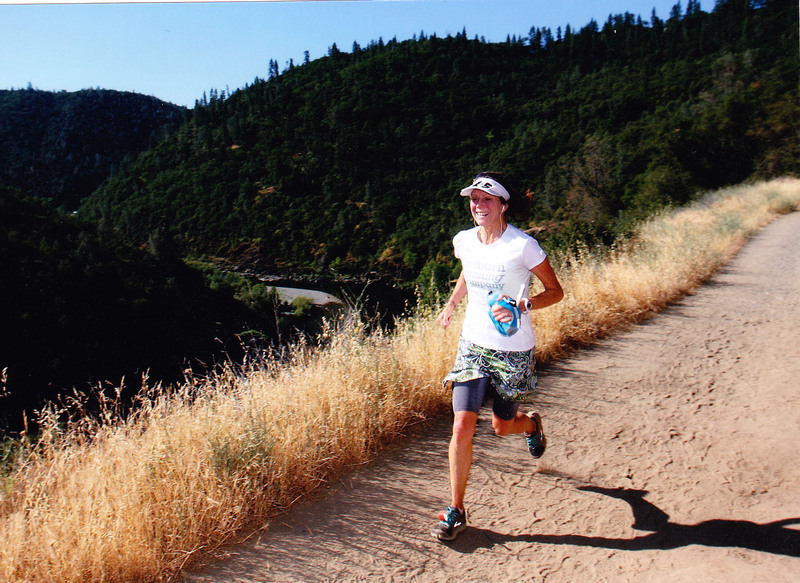 She is open to discuss how a paddler can train different than a cyclist, runner or triathlete. I am just a couple weeks into training with Julie and I am very happy with the communication and training program. I am excited to race again but also understanding that I do not have the luxury of just training and racing. I have a family to support and two businesses to run. Luckily I have an amazing wife and a great support crew that will help me achieve my goals. Thanks and happy paddling!! After just a few weeks on the o2fitness training plan I was able to come out with a win at the Jam from the Damn race here in Tahoe and take the overall points lead from Rob Rojas in the O’neill Tahoe Cup series! Neda marches on toward the Edible…. Kingsbury Grade is the Goal. I haven’t even seen the thing, but I hear it’s brutal. I’d be lying if I said I wasn’t downright frightened of giant mountains these days. I drive up them, passing cyclists who look pretty miserable but I stare with envy. How can I become one of those daring people who climb up Mt. Rose Highway, Geiger Grade, or all the way around all of Lake Tahoe? Well, frankly I just need to do it. Coach Julie suggested I go up the road that leads to the Ritz-Carlton, Lake Tahoe to start. I rode strong down Highway 267 and that itself was enough of a climb for me! Then I made a right turn, following the signs leading up to the Ritz and tried to push it, I really did I promise. But I turned around somewhere between quivering quads and a wobbly bike. OK, so maybe it’ll take a few tries. I’ve been doing single leg drills which Coach Julie says will help strengthen my legs and get me mentally prepared. She doesn’t want me to freak out, just trust the training… and I’ve been doing a lot of it. Every time I’d hop on my Trek Bike, I think of Phelps. Doesn’t everybody?! But his words hit me hard. I realized a lot of cycling is mental. I was feeling inadequate because I didn’t have as much cycling experience as a lot of the people on the road. I had to go through that learning curve of clicking in and out of the bike, I had to learn the right way to wear a helmet, and don’t even get me started on fixing a flat! But, who cares! As Phelps said, its all mental. If you doubt yourself, you will not make it. If you believe you will, then you will. So with this extra jolt of confidence and a few more weeks of training under my spandex… I decided to go up to the Ritz again. OK up Highway 267 I go again, then I hang a right towards the big hill. I had no idea how long the road was and I had no idea what curve I needed to pass to make it. So i just kept pedaling. I put the bike into my easy gear and just kept on twirling those feet. Every time I would get exhausted or my legs wanted to stop, I would just tell myself to keep going. I needed to see what was waiting for me at every corner, what was beyond that shadow, what was behind that sign. Until finally, I zoomed underneath some ski lifts and whizzed by the beautiful forest and lo and behold, I saw the prettiest thing ever – The sign to the Ritz-Carlton!! I think they should offer a free room for everyone who rides to the top, don’t you?! I took a pic and sent it to Coach Julie, my best friend, my boyfriend, and posted it on Instagram/Facebook (yes, I have no shame!) If I had Phelps’ digits, I would’ve sent it to him too. Then I realized what goes up, must come down… Weeeeeeeeeeeeeeee!!! Phenomenal coaching made for exhilarating training! I’m a newbie when it comes to getting coached, but not to working out. It is the best idea for improving one’s performance, especially if you’re in the doldrums. I was seeking growth, structure, and guidance. In the end I experienced trust, a fresh approach, and a new perspective. I absolutely loved receiving my daily workouts, and checking in with my coach about my performance. Julie had me doing repeats and speed work that I never dreamed I would do. Over the four months of preparation I saw physical improvement in strength, muscle definition, and speed. Most importantly, I was having FUN. Training was far more interesting and way less draining than ever before. Instead of my previous random workouts, my new plan had logical growth that was personalized. The key to all of this is good communication with your coach and total trust in their experience and expertise. I was ecstatic to reach my goal at “She Rocks The Trail 25K” by shaving 15 minutes off of my previous time. But really, it’s the journey down new paths of self-discovery that my coach, Julie Young, guided me to. It was the best adventure ever. I definitely got more bang for the buck! http://silversagecenter.com/wp-content/uploads/2014/06/she-rocks-racejpg.jpg 1476 2025 digitalnordic http://silversagecenter.com/wp-content/uploads/2014/06/SS_14171-Logo-Development-SportsLab-Horz-header-300x83.png digitalnordic2013-07-21 16:15:412015-01-21 07:44:13Phenomenal coaching made for exhilarating training! I just returned from an amazing week in Ketchum, Idaho which included competing in the US Mountain Bike Marathon National Champs. It reinforced with crystal-clear clarity that the mental thoughts dictate the physical outcomes. I entered the week with injured ribs and sprained right hand and fingers – my first mental opportunity to overcome adversity. I had the luxury of riding the course – which consisted of an approx 20-plus mile climb and 20-plus mile descent. Descending does not top of my lists of skills – as I don’t have bunches of time to devote to the mountain bike. The Ketchum trails are world-class and the race course was mind-boggling beautiful. However, the technical aspects of the descent toyed with me – trying to insert seeds of doubt with its ripping hour of twisting, turning, undulating single-track, intimately bordered with trees and hard rights with shear drops to the tiny town of Ketchum below. My pre-race mental prep and visualization focused heavily on how I wanted to ride the descent. My mental challenge was intensified by the fact that my currently injured ribs had resulted while mountain bike racing on a very similar, intimately tree-dotted descent. So I mentally had to hunker down – sweep away those negative hooks and replace them with the positive of how I wanted to ride the descent. Race day was picture perfect. I started the race with calm and composure – following my race day game plan. Until – one of my fellow-racers, hit the throttle, setting a pace – that was not exactly comfortable. I found myself falling in to a slightly frantic state, inefficiently struggling to keep pace. But I mentally gathered myself – regained my calm and composure and reminded myself to lean on my preparation and training – and trust it. My mind went to training sessions of hill intervals at sub to threshold and SFRs – working on pedaling efficiency – staying engaged in the trunk – and driving the linear force from my hips through the legs in to the pedals – maximizing efficiency and minimizing energy leaks. I also focused on find smooth, symmetrical fluid rhythm. I put my mental blinders on, settled in to my pace and rode my race. Before I knew it – I had passed my speeding-bullet, fellow-racer. As I passed and rode by, I kept with my game plan focusing on my race, trusting my preparation and not looking, or “thinking” back. Now I was on the descent – and it was an absolute dream – I floated with perfect relaxed, rhythm and timing. It exceeded my visualization expectations! I value the opportunity for these competitive outlets for self-challenge and resulting growth, confidence and empowerment. I especially appreciate my fellow-racers, who raise the challenge-bar and help me bust through self-imposed limitations – allowing expression of full potential.